An Edmonton veteran who suffers from post-traumatic stress disorder says the Department of National Defence has limited the areas he can visit on his base with his service dog. 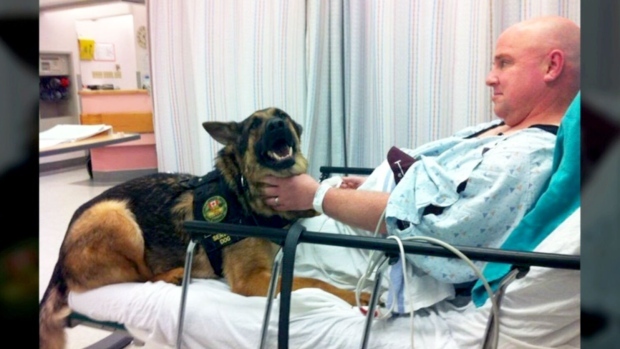 But the military says his dog does not qualify under the province’s Service Dog Act. Sgt. Jeffrey Yetman says he found out Saturday that will not be allowed to visit facilities -- such as the gym, mess hall, kitchen or family resource centre -- at Canadian Division Support Base Edmonton while he is accompanied by his dog, Diego. "It has totally taken (away) my mobility on the base," Yetman told CTV News Channel. "Right now, I have no idea where I can go with and without the 24-hour's notice." Before he found out about the news from a friend on the weekend, Yetman said he and Diego could pretty much go wherever they wanted on the base without a hassle. Yetman got Diego from the Wounded Warriors Weekend Foundation two years ago, and says service dogs give veterans like himself a "constant companion," which helps them get "back in the mainstream." "A service dog … takes us out of (a) dark corner and totally enhances our quality of life," he said. "Since I've had (Diego) my mobility and my quality of life has improved greatly. I've gained more confidence, I'm not so afraid of crowds -- I still have issues with it -- but he has my back for the most part." In a statement sent to CTV News, the base's public affairs officer, Capt. Donna Riguidel, said the problem stems from the fact that "none" of the dogs currently being used by soldiers on base qualify under Alberta's Service Dogs Act, which specifies that the animals must be trained through an Assistance Dogs International accredited school. "If someone had an ADI certified service dog, and had reason to be on the base, we will do our best to accommodate," said Riguidel. But Riguidel said that CDSB Edmonton recognizes the value of "emotional support animals" and will do their best to accommodate them on a "case-by-case basis." She added that the base also needs to consider the needs and medical concerns of other base employees, such as allergies or phobias. "We want to care for any member that expresses a need for an emotional support animal as much as we can, so we urge them to go through the process so everyone understands and is protected," she said. According to documents outlining the base's policy on service dogs, Canadian Armed Forces members accompanies by animals need to notify staff members in facilities 24 hours before a visit. A "long-term introduction" into the base would involve the base or a safety officer conducting a safety assessment. But in the meantime, Yetman is concerned about how the base's policy will affect the three other veterans with service dogs. "I hope this gets remedied here. I hope it doesn’t spread to other bases. In my opinion, it will have catastrophic effect," he said.